Peter Agre won the Nobel Prize in Chemistry in 2003 for discovering aquaporins (aka water channels) - the pores in a cell membrane that regulate water flow. Since his discovery (in 1992), researchers have found 13 types of aquaporins in mammals and expect that there are many more. They've also found aquaporins in bacteria and plants. Agre's work has many implications, none of which I'm going to discuss here...but you should read about it sometime because it's pretty interesting. Now that Agre has won a Nobel Prize, it appears that he is moving on to conquer bigger and better (?) projects - in particular becoming Senator of the Land of 10,000 lakes (that would be Minnesota, for you coasters). Agre plans to spend the summer with the voters getting a feel for his chances. Although less well-known to locals than other candidates at this point, I think he figures that if the state can elect a pro wrestler, why not a Nobel winner? The recent opening of the creationist museum highlights the ever-increasing importance of having scientists in important decision-making roles. At a time when American competitiveness, global warming, nano, intelligent design, nuclear, and related phrases are buzzing around Washington, I think it's a good idea to throw more scientists into the mix. So best of luck Peter! Check out Scientists and Engineers for America's Campaign Project for information on how to get involved in your local politics. Physics Buzz started as an unofficial project by APS staff to explore the blogosphere and write about interesting physics-y things that didn't fit in with our normal outlets. After 9 months we've decided to go semi-official. Don't worry, the only thing that is changing is our look (we wanted to align the blog more closely with PhysicsCentral, our home base). With PhysicsCentral, we communicate the excitement and importance of physics to everyone. We invite you to visit our site every week to find out how physics is part of your world. We'll answer your questions on how things work and keep you informed with daily updates on physics in the news. We'll describe the latest research and the people who are doing it and, if you want more, where to go on the web. So stick with us. It's a big, interesting world out there, and we look forward to showing you around. Why, when military jets zip by over head, is there a crackling to be heard in the roar of the engines? Know what I’m talking about? If not, here’s an F-18 Super Hornet video. It’s most noticeable around 2:55 minutes in. Space shuttles do it too. Before I get into the nitty-gritty of the research, led by Kent L. Gee of Brigham Young University, you’d probably like to know why this matters. Can you imagine working around these planes all the time, hearing crackle-crackle-roar at work every day? Or living in an area that the jet planes pass through on a regular basis? If physicists understand the noise, they can find a way to reduce it, improving life for military personnel and communities whose airspaces are frequented by these jets. Apart from that, who doesn’t want to know about the acoustics of jet engines? Let’s get down to business. A sound, traveling through air, alternately compresses and expands the air molecules, and our ears react to these pressure changes. These physicists wanted to be able to see the sounds of the engine, so they made a graph. They measured the pressure of the air in the exhaust plume of an F/A-18E Super Hornet. Pressure is plotted on the y-axis to see how the pressure varied over time. 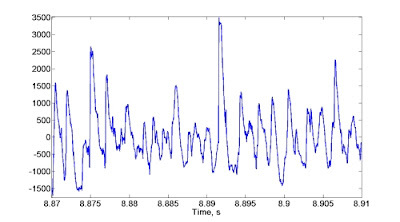 In the plot below, all those fluctuations happened in a mere four hundredths of a second! So, what marks this graph as a crackler? Notice how the peaks go further away from zero than the valleys, with a maximum of 3500 as opposed to the minimum of -1500. Also notice that the peaks are generally narrower than the valleys. In a more ordinary engine roar, the peaks and valleys would be random but equal. Not so when your engine crackles. To more clearly demonstrate these observations, the researchers took this data and plotted it another way. Now, the y-axis is the probability that the pressure is a certain distance away from zero. 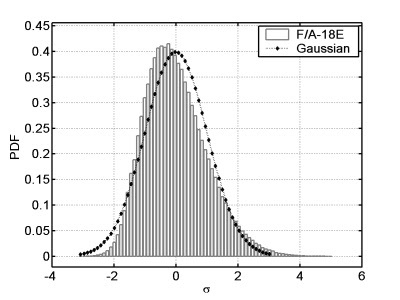 The “Gaussian” curve is just a model of what the graph would look like if the pressures were truly random and centered around zero. There are two things to notice about this graph. 1) The majority of the graph is on the negative side. This shows that the pressure has a tendency to be below atmospheric pressure. 2) Notice that the graph stretches further on the positive side than the negative side. This shows that the air compressions tend to deviate from normal atmospheric pressure more than the expansions. Now, the researchers thought they knew what sort of pattern makes the crackle, so they tried to create a sound with the same pattern. These are the patterns for the sound (AB Jet) and the simulated sound. Have a listen… Hear the crackle? No, there’s nothing wrong with your ears. Apparently, the crackle is dependent on more than just the tendency toward lower pressures and brief, strong compressions. What went wrong? The graphs of the sound and the simulation look pretty similar. But wait, take a closer look at the peaks for the jet. The rising side is almost vertical while the falling side is more gradual. The new thought is that the quick jump in pressure causes the crackle, not the overall distribution of peaks and valleys. Can’t be sure without another experiment! You’re sitting on the rocky surface of a distant planet, in your climate controlled space-suit, watching the suns rise. That’s right, two suns, and one of them is a neutron star. Its companion is not dense enough to keep its matter to itself, so there is a trail of stardust linking the two suns. The more interesting of the two is the accreting neutron star – a neutron star that is gaining matter. This matter forms a ring around the star as it makes its way toward the surface. Near the surface of the neutron star, the hydrogen-rich matter compresses until the nuclei are forced to higher energies. The hydrogen fuses steadily, creating helium and heat in the atmosphere. Now the conditions are set for a spectacular phenomenon – an X-ray burst. Carbon and oxygen are rapidly converted to heavier elements in the range from nickel to cadmium, releasing extra energy in the form of X-rays. It's a runaway fusion reaction, exploding in the star's atmosphere! An X-ray burst requires a trigger. The trigger reaction involves a radioactive isotope of oxygen, oxygen-15 (mass number 15), and a helium-4 nucleus (a.k.a “alpha particle”). The oxygen-15 fuses with the alpha particle, resulting in a neon-19 nucleus and a gamma ray. When gamma rays are emitted in such a reaction, they usually have a range of different energies. The peaks in the energy distribution, or the most common energies, are called resonances. Twenty years ago, theorists predicted that the gamma ray has only one resonance, and its energy is 4.03 million electronvolts, or 4.03 MeV. Since then, researchers have been struggling to confirm or refute this calculation through experiment. The trouble is that current facilities can’t make a beam of oxygen-15 that is intense enough to create the trigger reaction in a laboratory. Many scientists tried, but none succeeded. Researchers at Notre Dame University, led by Michael Weischer, decided to try it backwards. They made neon-19 with extra energy, 4.03 MeV to be exact. The excited neon nucleus would then decay. Nuclei decay in many ways. They emit protons, neutrons, alpha particles, gamma rays, and X-rays in many combinations. In this case, the scientists wanted the neon-19 to emit an alpha particle, resulting in oxygen-15. This decay doesn’t happen very often, so sensitive detectors were needed to accurately measure it. They also measured the lifetime of neon-19 in a 4.03 MeV excited state, or how long it remained excited before decaying. Researchers use these two pieces of information to figure out the reaction rate, how often the alpha particles and oxygen-15 nuclei fuse. These measurements are also helpful in setting tight limits on the accretion rate, and most importantly, the ignition point of the X-ray burst reaction. This point, between steady burning and explosion, is at about 1.9x1028 grams per second. Want a more formal rundown? Check out the Joint Institute of Nuclear Astrophysics (JINA) "Nugget." Or, if you've got the hook-up, this research is soon to be published in Physical Review Letters. ...for the mathematician in you. From Auto Week's But Wait... There's more, May 7, 2007. Inside your computer, data is stored on your hard drive in magnetized form. In magneto-speak, an area magnetized in one direction is called a domain. A domain magnetized to the left becomes a “one” and a domain magnetized to the right becomes a “zero.” The disk must spin while it is read, which makes this mechanical system relatively slow. Once the data is stored electronically, as in integrated circuits, it moves much faster. We can't use electronic systems all the time, though, because the data disappears when you turn the machine off. IBM’s Stuart Parkin patented the concept of a “racetrack” hard drive in 2004. Imagine a string of red and blue beads. The beads are pushed past a sensor. Rather than looking at whether the bead is red or blue, the sensor looks for the points where the bead color changes. In reality, the system is a magnetic wire with many domains. 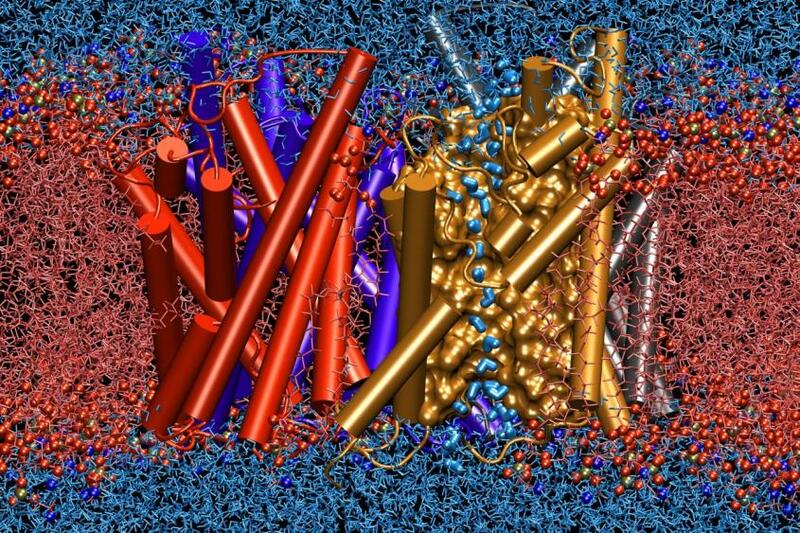 In between the domains is a domain wall, a region in which the atoms switch alignment. It’s like a purple bead in between red and blue groups. A spin-polarized current, or a current in which the spins of the electrons all point in the same direction, causes the domain walls to shift along the magnetic wire. The sensor measures bits as short time slices. If the sensor sees a domain wall in that time, then the bit is a one. If it does not, it’s a zero. However it’s not quite like beads on a string. For one, the current does not push the domain wall like a hand pushes a bead. Instead, it’s more like a chain reaction in which the spin-polarized electrons start turning the atoms, which turn their neighbors, and so on. The domains and domain walls move even though the atoms stay in place. So, if this system was patented in 2004, why am I blogging about it in 2007? Well, this racetrack hard drive was only a concept then. Researchers from Germany, South Korea, and California have been collaborating on a project which could help make it a reality. In early May, they published results in Physical Review Letters with the intimidating title, "Direct Imaging of Stochastic Domain-Wall Motion Driven by Nanosecond Current Pulses." Unfortunately, the domain walls tend to get snagged on imperfections in the wire. Going back to the beads, it's like a knot in the string. Racetrack hard drives have a way to go before you’ll find them at Best Buy, but they may well be on the distant horizon. Original story from Physical Review Focus. Text excerpted from writings by Ian McEwan. Featured artists (T-B): Siobhan Davies, Antony Gormley, William Hunt, David Buckland. ...we will not rescue the earth from our own depredations until we understand ourselves a little more, even if we accept that we can never really change our natures. Are we at the beginning of an unprecedented era of international co-operation, or are we living in an edwardian summer of reckless denial? Is this the beginning, or the beginning of the end? On board the 100-year old Dutch schooner, The Noorderlicht, Cape Farewell has sailed right to the heart of the debate. From this vantage point the artists and scientists aim to illustrate the workings of this crucial part of the planet, drawing attention to the role ocean currents play and the effect rising CO2 levels and changing weather patterns will have on us all and our climate. A beautiful and moving illustration of science and art working together. Hello physics enthusiasts! Name's Katie. I just started as a science writing intern for the American Physical Society and thus have the privilege of posting to Physics Buzz. I graduated from Michigan State University about two and a half weeks ago after four years studying professional writing and physics. I look forward to relaying physics-related news to y'all (along with commentary that is probably intended to be witty :-) Over and out! As someone that has a certain affinity for Dawson's Creek, Family Feud, and America's Next Top Model you might not want to take entertainment advice from me, but I have to at least bring up this new show slated to premiere next fall on CBS. From writers/producers Chuck Lorre ("Two And A Half Men") and Bill Prady ("Gilmore Girls") comes a new comedy that shows what happens when two hyperintelligent scientists meet a beautiful woman--and realize they know next to nothing about life outside of the lab. -Thanks to Physics Babe for the tip! A number of years ago, I was working a gig as the assistant to an editor of a major journal. My job was simple: process the papers as they were submitted and follow up with the referees. Aside from an occasional 2am call I made to scientists in places like Russia and Denmark reminding them their reviews were overdue, it was a mostly uneventful, but relaxing, position. But one day, I walked into my office and my life changed. On my desk was a packet that included a type-written paper and a type-written letter. My boss attached a sticky note asking me to copy and file it. Everything was within normal parameters until I glanced at the signature on the letter. My heart stopped as I read it – the letter was from Hans Bethe. To me, the offspring of a scholar of physics history, who knew about Oppie and his crew even as a wee one, this was equivalent to being handed an album autographed by a Beatle (specifically Ringo). The letter was not important to the review process; it was only the cover letter after all, so I asked my boss if I could keep it. He told me no, and instructed me to file it. As a consolation, he offered that when the next Bethe paper came in, I could keep that accompanying letter. I was obviously disappointed but I respected the editor’s decision. But I pined for the pen of the Prize-winner. So one day a few weeks later, I opened the file just to glance at the signature of this remarkable scientist and dream about adding it to my collection one day. But shocker of shocks, the letter was gone! I told my boss about it, concerned that some bandit had snuck into the office and stolen this valuable piece of physics history. Surprisingly, he did not display any sense of astonishment at its disappearance. He simply shrugged it off. My heart sank. The letter was gone, and my dream of a Bethe signature for my collection broke into a million little quark-sized pieces. Years later, it finally occurred to me that the editor, realizing its value, probably procured the letter for himself and then pretended to not know anything about its departure. Perhaps he has his own collection of Nobel autographs. I welcome autographs from all Nobels, both once and future. Copyright, 2007, Alaina G. Levine. Some people collect stamps or model trains. I collect the autographs of Nobel-prize winning scientists. I don’t have many, but my collection is growing. I started seeking the signatures years ago in a fortuitous moment at the Intel International Science and Engineering Fair. While doing PR at the fair in 2000, I sat in on a panel discussion with five Nobels. After the talk concluded, I saw in amazement as the kids in the audience rushed the stage, clutching the event program in their sweaty hands with the focused goal of getting the scientists’ autographs.It was pandemonium. It was chaos (in application, not theory). The scientists were celebrities to these children. Not to be left out, and realizing the youth often are an excellent barometer of value trends, I grabbed my program and pushed my way through the crowd. I succeeded in securing what I considered at the time to be the most coveted of the autographs: those of Lederman and Curl. Sure, I knocked down some nerds along the way, but collateral damage is to be expected when your eyes are on the (Nobel) Prize. Later I ran into Lederman and introduced myself. I had been working for the University of Arizona (UA) Physics Department at the time and I complimented him on his work to promote changes in physics education in secondary school. He took my business card and promised to stay in touch. Lo and behold, within two weeks he mailed me a packet of articles and information about his cause. And as I read the literature I knew I had scored big time: he had included a personal letter to me thanking me for my help, and signed it “Yours Truly, Leon”. So I realized I had something here. It didn’t take me long to gather more. Alan Heeger stopped by the campus that fall for a lecture and I got his John Hancock on a promotional poster with his picture. And of course, I couldn’t resist asking Murray Gell-Mann for his autograph following a seminar he gave at the UA on Native American archeology. I think he got a kick out of my request. Like any dedicated collector, there came a time when I was presented with a monumental opportunity to grab what I considered to be the jackpot, the gold at the end of the physics rainbow, the piece that I knew would make my menagerie the envy of all science geeks everywhere and give my life purpose. Here's another uber-geeky widget I made for your desktop. It's a clock that displays time in the form of resistor color codes. The time being displayed here is 11:06 AM. Don't worry if you can't remember the colors, if you run the widget you can refresh your memory by right clicking the clock and checking the table in the "About" option. Besides being a nerdly clock for experimentalists, electrical engineers and all other solder jockeys, it might be good practice if you have trouble telling your resistors apart without a multimeter. You could always download one of the many binary clock widgets instead, if you're into that sort of thing, but I believe this is the first (and so far, only) resistor color code clock ever. This stuff is addicting. I've made six widgets in three weeks. Most of them do nothing interesting at all. I may have to go into widget detox soon. PS: Now you can get the precision version of the Resistor Clock with seconds displayed as well. ...those species in which there is more social mixing between males and females have evolved bigger brains with higher-level thinking. ...ceiling height affects problem-solving skills and behavior by priming concepts that encourage certain kinds of brain processing. ...people will drive more cautiously if they believe they are in a dangerous environment. How about a shirt that eats smog, letting you breathe clean air? Insects of all types get miniature pies flung at them all for science. I've built various versions of this thing over the years, starting with programs I wrote in BASIC on the Apple II PCs in my high school programming class, to hardware fireflies made of LEDs and TTL chips in my college lab (I was supposed to be doing experiments for my electricity and magnetism lab, but I got distracted), to Pascal, Fortran and Visual C++ programs - and finally a widget. These days, things like this are described as examples of the emergence of complexity in systems of simple objects. I didn't know that when I made my first one, but I was intrigued to find the pretty patterns that formed all by themselves when I gave the simulated fireflies a few rules to help them decide when to flash. In this widget, fireflies live on a 25 by 25 grid. They each have an internal timer that tells them how long to wait between flashes. Interesting things can happen when you instruct them to pay attention to their nearest neighbors and change the timing of their next flash based on what's going on nearby. To make a firefly want to flash at the same time as those around it, you turn up the coupling between fireflies. If you want them to avoid flashing along with their neighbors, you can turn the coupling down until it's negative. You can also add some randomness to the timing (with the 'random noise' setting), or change the period that fireflies wait between flashing with the 'flash period' controls. There are a few other controls to fiddle with. The rest of the instructions are on my other blog, The Dark Net. I built the widget version of this toy in part for my own amusement, and in part as a present for all the people who have signed up to read my online science fiction novel. I'm also hoping it will keep them from getting bored waiting for the next chapter to come along. Humans have long displayed an uncanny ability to make emotional connections with their manufactured helpmates. Even in the face of possible snickering, I admit that there is a stuffed bear in my life. I have old shirts that I won't part with because of the memories. 4 different apartments have played gallery to pictures my college roommate colored for me. I can easily see myself getting attached to a robot. Digital pets like the Tamagotchi or the Furby, designed to be cute, have long caused children to make spooky levels of connection. But children aren't the only ones. The Washington Post has a fascinating article about the relationships humans develop with intelligent machines. To the soldiers they work with, robots can become family. Losing a robot IS losing one of the team. These inanimate objects have been promoted, awarded purple hearts, and grieved for. What's remakable about the battle bots is that humans bond with them even though their designers have made no attempt to load them with emotional cues. What does this mean for the military? What does it mean for us? In Cast Away, Tom Hanks risks his own life to save a volleyball named Wilson, who has become his best friend and confidant. What if people started turning to robots to fulfill their emotional needs instead of turning to people? The 2 million personal bots in use around the world in 2004 are expected to grow to 7 million next year. The South Korean Ministry of Information and Communication hopes to put a bot in every home there within six years. Predicting the results of a personal robot in every home is probably as futile as trying to predict the results of a personal computer on every desk was 40 years ago...but it might be a challenge worth facing. There's been lots of excitement in the past year or so over the possibility that physicists will soon develop a real-life version of Harry Potter's invisibility cloak. Check out this Google News search to get a taste of the coverage. The technology relies on unusual manmade metamaterials, with intricate microscopic structures. In addition to cloaking devices, metamaterials are touted as potentially leading to superlenses that could provide distortion-free magnification far greater than any conventional lens. The only problem with these wonderful applications for metamaterials is that I am pretty sure they can't possibly work. Why not? The short answer is that, as far as I know, there's no such thing as an invisible fly. You see, nature (which is to say evolution) is pretty good at making complex structures. The photonic crystals that make peacocks, coleoptera beetles, and Lycaenid butterflies so beautiful are at least as intricate as invisibility-cloak metamaterials would have to be (if they're possible). Some of my coworkers have argued that I'm being a bit narrow minded about this - after all, they say, insects didn't evolve to make handguns, automobiles, telephones, or radio transmitters, yet those things are possible. That's true, but insect have ways of managing all the things that those devices do. They have evolved countless ways to move around, communicate, hunt, and defend themselves. Often those things look a lot like our inventions. It's certainly true that many (if not most) living things rely on some form of invisibility from time to time. The patterns in the coats of jaguars and tigers can make them essentially invisible in the mottled shadows of the jungle. Chameleons and octopi control the flow of pigments in their skin to match their surroundings. Sticks insects, various leaf hoppers, some moths, and countless other insect can be invisible when nestled among the sticks and plants that they resemble. So, invisibility is terribly important for predators and prey alike. Yet there are limits to most invisibility schemes in nature. A jaguar wouldn't have much luck hunting penguins against the backdrop of the Antarctic, and a polar bear would never be able to hide it's white coat on the savanna. 1. True invisibility would give just about any living creature HUGE evolutionary advantages over it's competitors. 2. Evolution is great at creating complex structures of the type that should theoretically yield the metamaterials necessary for invisibility cloaks. Maybe I'm wrong. Perhaps we're surrounded by invisible animals. I have a feeling, however, that we would know if there were any species of invisible predatory cats. 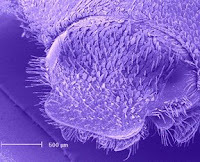 And while mosquitoes are pretty stealthy, I've never been bitten by anything that wasn't at least visible under a microscope. Does Nature have some objection to metamaterials? Perhaps. But I'm guessing that Nature hasn't produced any invisible animals because nothing, including metamaterials, can make things invisible. I was bummed this morning to realize that I missed Baltimore's self-proclaimed "Almost Famous Annual East Coast National Championship Kinetic Sculpture Race." For those of you unaware of this almost famous race, competitors must build a human-powered sculpture that can travel by road, water, and mud. The sculpture must be no more than 8 feet wide, 13 feet high and 35 feet long...otherwise anything goes. After looking at these pictures I am so kicking myself for missing the show. What an engaging display of engineering, art, and creativity! It reminds me of the early days of electricity when Franklin and his contemporaries used their newly discoverey knowledge to perform parlor tricks such as electrifying glasses of wine. Why? I guess because in both cases "increasing science literacy" wasn't a motive behind the event. I believe that when you explore nature you'll always find science, art, and creativity. And what better way to explore nature than to build a human-powered sculpture that can travel on road, water, and mud?? Visionary art as defined for the purposes of the American Visionary Art Museum refers to art produced by self-taught individuals, usually without formal training, whose works arise from an innate personal vision that revels foremost in the creative act itself. E equals m c squared? C does not stand for the speed of light, c is for cookie. A sheet of plastic invented by researchers in Japan could one day make for tables and walls that power devices placed on them — without any need for wires or plugs. Not science related, but still worth raising an eyebrow over. Bumper sticker - good astronomy? The Royal Society of Chemistry said that as maths was a difficult subject, schools feared examination failures which would threaten their standings. A passionate alchemist who predicted 2060 as the year when the book of Revelation comes to life, Newton was more than a scientist who got hit on the head with apple and composed the theory of gravity. That well-rounded Newton is the subject of a NOVA special that will air for the first time tonight: Newton's Dark Secrets. Truth is, many great scientists of the past have what today we might call "dark secrets." Marie Curie suffered severe depression, Albert Einstein was a lousy husband, Galileo studied astrology, and Ben Franklin had a weakness for women.